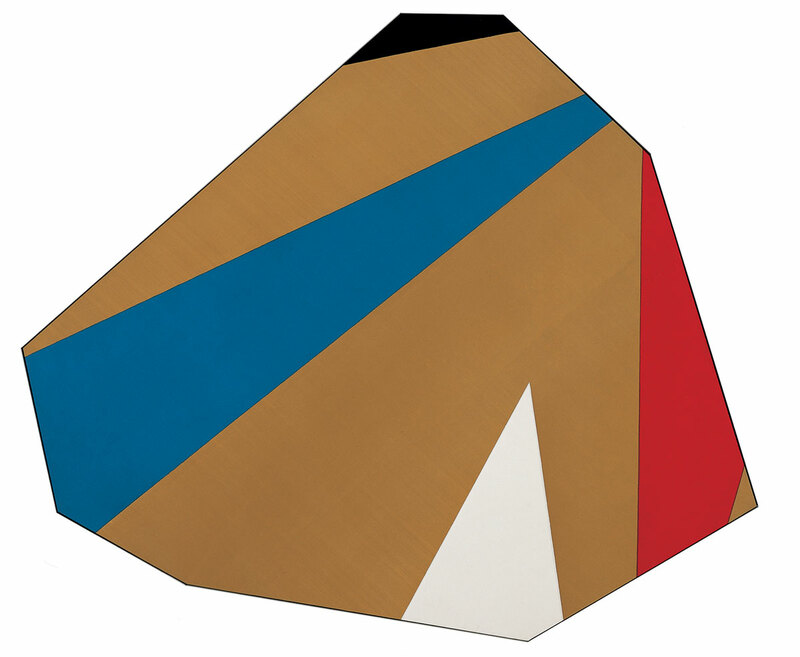 © Kenneth Noland/Licensed by VAGA, New York, NY. Photograph by R. H. Hensleigh. Noland adopted this stain technique for a series of concentric circle paintings begun in 1956, in which nested rings of vibrant, often uncomplementary colors occupied the center of a square canvas. A mix of hard-edged geometry and softer, thinly applied stains, the clash of color in these works generated a sense of outward pulsation. Continuing his exploration of the ways in which a picture’s formal structure might be used to highlight color, the artist moved to painting ellipses, and then chevrons, in which the tip of an angled shape touched the bottom edge of the work. But soon Noland, then living and working in New York City, was frustrated by the “inertia” he sensed in the empty, raw corners of the canvas. In a trajectory emblematic of the idea of modern art as a self-critical process of solving successive formal problems, he painted a series of horizontal stripes and allover “plaid” patterns in the mid-1960s before beginning to vary the rectangular shape of the canvas by tilting it off-axis and using elongated diamond or irregularly shaped formats. More recent work from the 1980s features clay, handmade paper, and canvases of acrylic paint mounted on Plexiglas.